You want to study German in order to apply for a full time study programme in Germany? We offer intensive courses for levels A2 to C1 all year round. Additionally you can take crash courses for a systematic preparation for the language exams DSH and TestDaF. For people who had to flee their home countries and want to study / continue their studies at university in Germany. The places free-of-charge are supported by the funding programme »Integrating Refugees in Degree Programmes (Integra)« of the DAAD. Twice a year: The aim of the Spring resp. Autumn Course is to make it easier for the new foreign exchange students to settle into Göttingen university. The German courses include a lot of extracurricular activities for orientation and for getting to know each other. The Summer Course in August combines intensive German lessons with an extensive programme of language tutorials, parties, free time activities and day trips. The course is open for all persons and student groups interested (minimum age of 18 years). 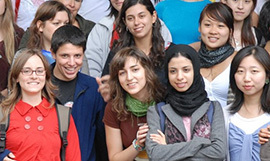 Promoting the internationalization of the Georg-August-Universität Göttingen and the Göttingen region in general is a central objective of the Institute for Intercultural Communication (IIK e.V.). Located on campus, our non-profit association operates in close cooperation with the Georg-August-Universität Göttingen and the Bildungswerk ver.di (Educational Institute of the United Service Union in Lower Saxony). Additionally, the IIK is a member of the non-profit organization "Professional Association German as a Foreign Language (FaDaF)" and has therefore signed a voluntary declaration of commitment to uphold high standards in teaching by ensuring that teachers are properly qualified and paid a fair wage, that the learning and teaching environment and conditions are conducive to good learning, and by carrying out objective evaluation.